Secretary Bergland, Assistant Secretary Cutler, other policymakers in the Department, and I feel strongly that organic farming must be given more attention in the Department. Dr. Cutler has asked that SEA establish a coordinating mechanism for organic farming. You are being designated as the SEA Coordinating Team for organic farming to provide SEA technological and educational leadership and staff support on matters relating to organic farming, together with Garth Youngberg, whom we anticipate will be undertaking an IPA appointment from Southeast Missouri State University later this spring. The Coordinator and Chairman will be expected to spend essentially full time on this matter during the period of his detail to this specific activity. Other team members will undertake assignments as needed to carry out the work of the team. Other SEA personnel are in position to serve as special resource people because of their interest and experience. James Parr (AR-Beltsvilie) and T. M. McCalla (All-Lincoln) are two such individuals on whom we’d expect you to call. For the purpose of satisfactorily completing this study, you are to arrange for the participation of plant pathologists, entomologists, weed scientists, agricultural engineers, horticulturists, economists, and other disciplines as needed, for short term participation as needed in assessing the benefits, values, economic impacts, costs, and associated with the use of organic residues in the absence of pesticides. The purpose of this memorandum is to provide you with background information and general guidelines for conduct of this important assignment. The Department and SEA have responded in a positive, if somewhat limited, way to this issue in the past. For example, we have 1) a bibliography for small-scale and organic farmers, 1920-1978; 2) a report to the Congress entitled “Improving Soil with Organic Waste,” pursuant to Section 0.461 of the Food and Agriculture Act of 1978, .P.L. 95-113; 3) a budget increase in FY 1979 in the amount of $3.0 million for research and $2.0 million for extension; and 4) a number of other reports and actions related to organic farming. 1. Conduct selected case studies and review published technical reports to inventory and assess the activity of organic farming in different parts of the U.S.
2. Suggest the reasons why food and fiber producers turn from conventional practices to organic farming and vice versa. 3. Determine the information needs of, or technological barriers to, successful and profitable organic farming. 4. Analyze the economic impacts of organic farming in the future. 5. Identify the research and educational programs currently underway which support organic farming and inventory and extent of this level of activity. 6. Determine research and education programs needed in organic farming and support division of responsibility and plans for meeting these needs. 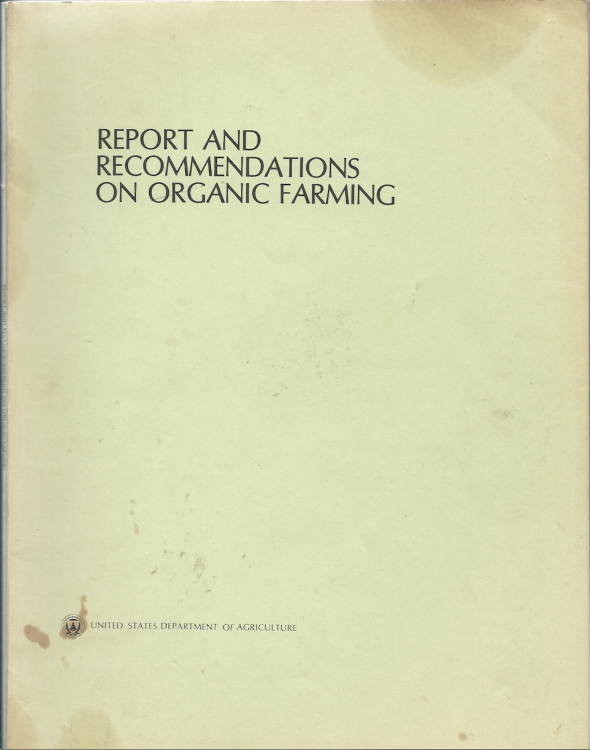 In pursuing these objective related to organic farming, you are to report directly to the Chief, PDCS/JPE, and, through him, provide staff support and technological counsel to the Director of SEA and the Assistant Secretary for Conservation, Research, and Education for conduct of these specific assignments: 1) carry out case studies and analyses of published reports as indicated above, 2) develop a policy level paper to present issues and options, 3) assist in arranging for and the conduct of seminar on organic farming for SEA personnel and other interested USDA and cooperator personnel, 4) identify what SEA and other Departmental agencies are doing now, 5) assist SEA and others in the Department in responding to questions and requests for information, 6) furnish suggestions and technological counsel for the SEA Information Staff on popular publications about organic farming. I wish to have an introductory briefing session and discuss this with you as you start this assignment. This is now being arrange for April 19-20.